Neuromodulation is an emerging field that explores the use of electrical, chemical, and mechanical interventions to heal neurological deficits. Such neurostimulation has already shown great promise with disorders and diseases such as chronic pain, epilepsy, and Parkinson’s disease. This is the first concise reference covering all of the basic principles of neuromodulation in a single affordable volume for neuro-residents, fellows, and basic clinical practitioners, edited by two prominent clinical experts in the field. This volume emphasizes essential observations from all of the important clinical phases involved in any neuromodulation: targeting, intraoperative assessment, programming, complications, and complication avoidance. 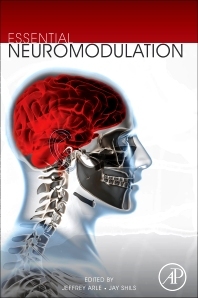 There are commonalities to all neuromodulation procedures that must be brought to the forefront to form a cohesive presentation of neuromodulation, and such emphasis will give readers a more solid grounding in the fundamentals needed to embrace this field as a cohesive clinical entity. Dr. Arle is currently the Associate Chief of Neurosurgery at Beth Israel Deaconess Medical Center in Boston, the Chief of Neurosurgery at Mt. Auburn Hospital in Cambridge, and an Associate Professor of Neurosurgery at Harvard Medical School. He received his BA in Biopsychology from Columbia University in 1986 and his MD and PhD from the University of Connecticut in 1992. His dissertation work for his doctorate in Biomedical Sciences was in computational modeling in the Cochlear Nucleus. He then went on to do a residency in neurosurgery at the University of Pennsylvania, incorporating a double fellowship in movement disorder surgery and epilepsy surgery under Drs. Patrick Kelly, Ron Alterman, and Werner Doyle, finishing in 1999. He edited the companion text Essential Neuromodulation with Dr. Shils, the first edition published by Elsevier in 2011. He has now practiced in the field of functional neurosurgery for 17 years and is experienced in all areas of neuromodulation from deep brain stimulators to vagus nerve, spinal cord, peripheral nerve, and motor cortex stimulators, contributing frequent peer-reviewed publications and numerous chapters to the literature on many aspects of the neuromodulation field. He currently serves as an associate editor at the journals Neuromodulation and Neurosurgery, is the co-chair of the Research and Scientific Policy Committee for the International Neuromodulation Society, and is on the Board of Directors for the International Society for Intraoperative Neurophysiology. His longstanding research interests are in the area of computational modeling in the understanding and improved design of devices used in neuromodulation treatments. Jay L. Shils, Ph.D., D.ABNM, FASNM, FACNS is the director of intra-operative neurophysiology and associate professor in anesthesiology at Rush University Medical Center in Chicago, IL. He received his Bachelor of Science degree in electrical engineering from Syracuse University, and both his masters and PhD in Bio-Engineering at The University of Pennsylvania investigating higher order signal extraction and processing techniques on human EEG data to investigate interactions in the visual system and in epilepsy. He began his work in the field of intraoperative neurophysiology in 1995 specializing in single unit recordings during surgery for movement disorders in the Department of Neurology at the University of Pennsylvania School of Medicine. Dr. Shils' research interests include investigating methods for improving real-time intraoperative neurophysiologic techniques as well as theoretical research in neuromodulation mechanisms of action. He has published over 30 peer reviewed papers and multiple chapters on intraoperative neurophysiologic surgical technique, post-operative management of movement disorders patients, and computational modeling as related to neuromodulation effects on various neural circuits. He is the co-editor of two books: "Neurophysiology in Neurosurgery: A Modern Approach" with Dr. Vedran Deletis; and "Essential Neuromodulation" with Dr. Jeffrey E. Arle. Prior to going to graduate school Dr. Shils was an electrical engineer at the Electric Boat division of General Dynamics where he was involved in various modifications to existing electrical systems. Dr. Shils is the past President of the International Society for Intraoperative Monitoring and was the founding secretary of the society. He is a past board member of and past chairman for the American Society of Neurophysiologic Monitoring ethics committee and is the 2016/2017 president of the ASNM. He is an associate editor for the Journal of Neurosurgery and Journal of Clinical Neurophysiology.